Last night I was listening in on a conversation about the dangers of cycling with cars and was kindof surprised by the range of opinions that were expressed about cycling safety. Ideas from hyper-defensive riding (assume all cars are trying to hit you), to reasoning with drivers a their windows, to mandatory transponders that inform drivers a squishy human is near, and every possible solution inbetween surfaced as a way to keep cyclists safe. All this got me thinking about scary things that keep people off their bikes (cars, thunderstorms, fear of bears in the woods), and it reminded me of a great article I’d just read about why people ride. Click here to read it. One thing that really hit home in the article was the diversity of cyclists it discussed (commuters, racers, just-plain-crazies, etc), and how for every flavor of cyclist the bike was a freedom enabler. Be it geographical exploration, self-expression, or just exercise, bikes let people do what they want, how they want. Anyway, that’s enough analysis from me. Check out the article, or go ride your bike! 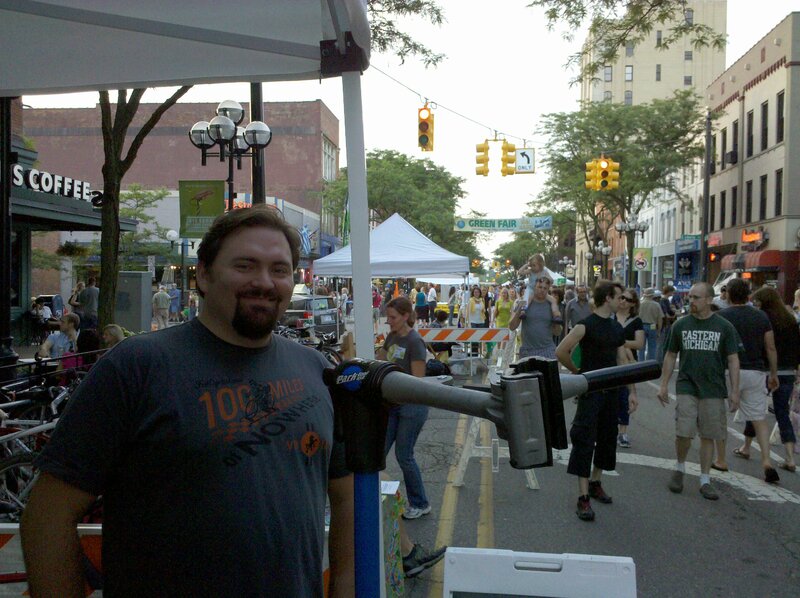 Turns out, popping up a bike stand in a random destination and helping people out is what we do best. 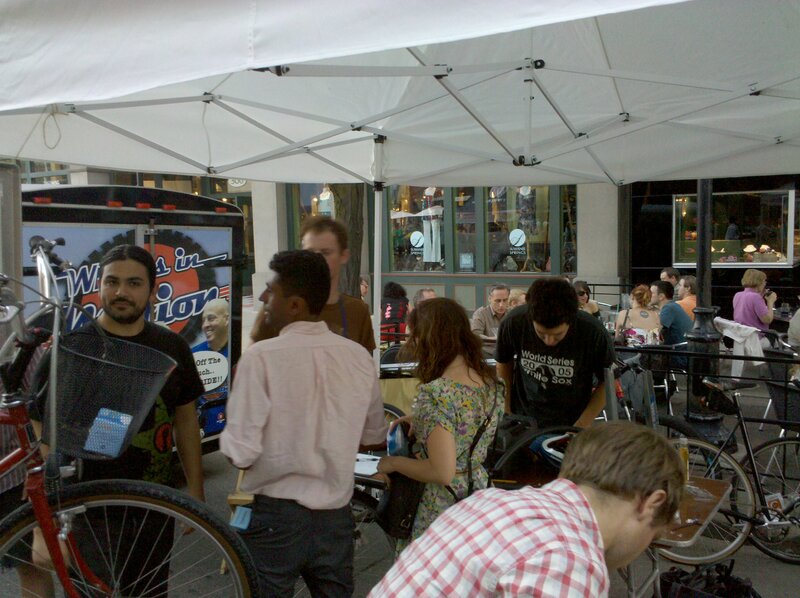 We had a blast healing handlebars, soothing shifters, and doctoring derailleurs. Sam was a hero, showing a young bike enthusiast how to get a wicked hop out of a well-worn mountain wheel. Below you can see Evan explaining basic maintenance and Ben getting ready to true a wheel. It was really great to hear everyone’s enthusiasm: from new volunteers signing up to general excitement about stopping by the stand on Sunday. As we continue to grow, we need your feedback! How can Common Cycle help you the most? For new volunteers, how can we showcase your skills best? 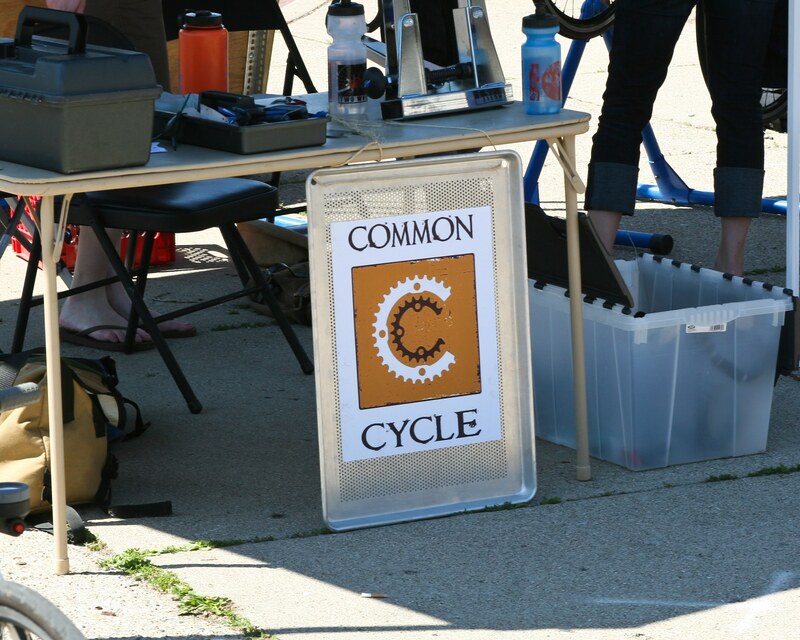 We welcome all ideas, so send them to info@commoncycle.org and tell them to us in person! A big thanks to everyone who helped us out last night: Piet, Evan, Justin, Sam, Bill, Ben, Anika, Sandy, Jimmy, and Eric for hanging out at the stand, Michael from the Black Pearl for the post-fest libations, Ryan for trailer #2, Vault of Midnight for the tent, and everyone who stopped by for giving us something to tweak, tune, or talk about! 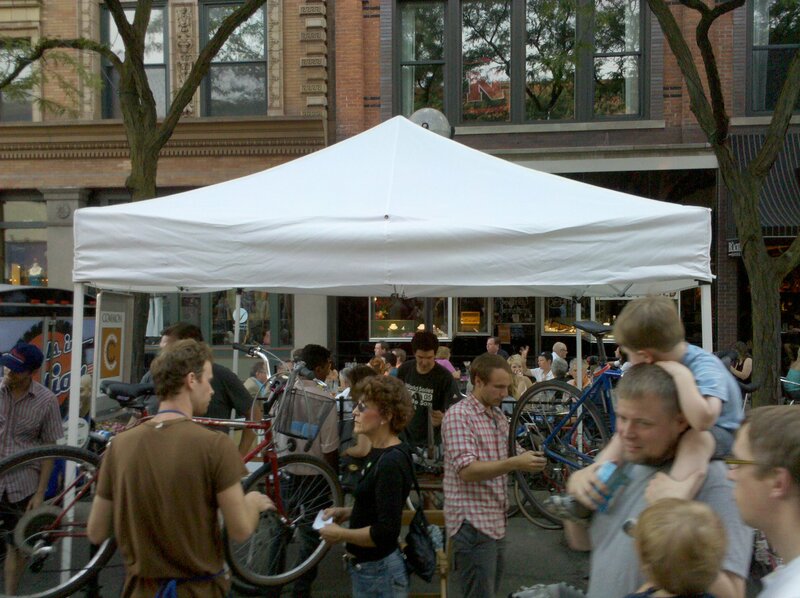 While it is hard to believe that it has already been seven weeks of helping folks with their bikes at the artisan market, it is clear we’ve grown a lot since day one. 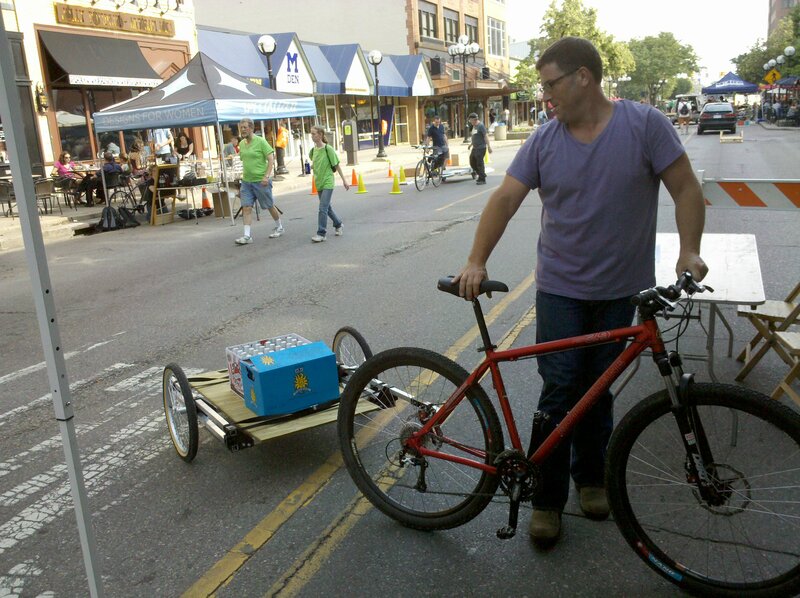 Kindof like a tandem rolling to the ice cream shop, Common Cycle seems like something people want to hop aboard. 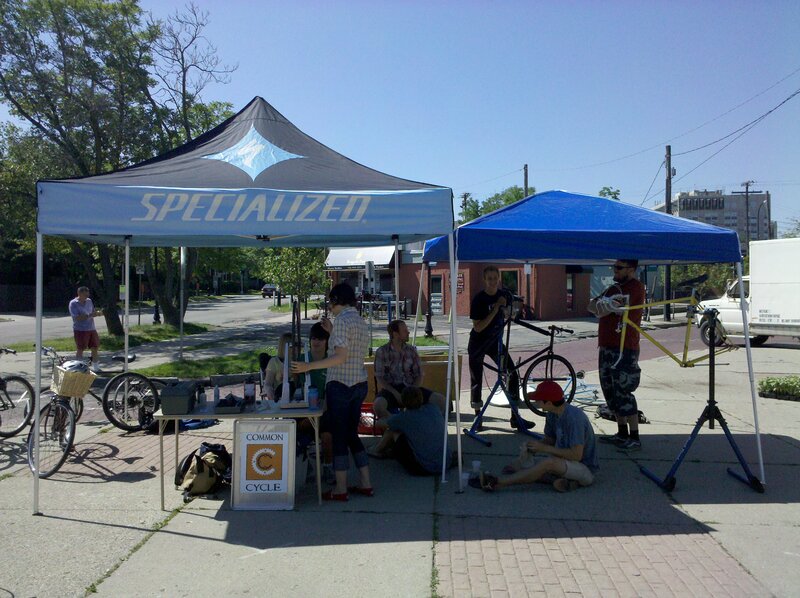 The fruits of the tremendous community support we’ve been receiving were evident this week: two popup tents to give us some shade, three work stands, two full sets of tools, and over ten mechanics sharing their time and expertise. With these great resources, we’ve been able to take the 10-15 bikes that stop by each Sunday and get them back on the road, rolling safely. 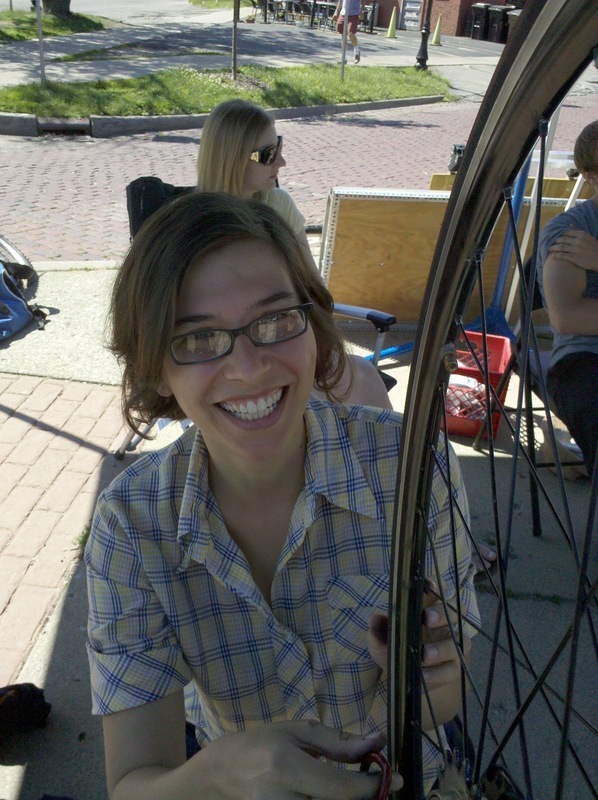 More importantly, common cyclists like yourselves are telling us that you’re learning a lot, and feel empowered to tinker with your tools and come back to learn more. Some of the fun activities from this week included overhauling the bottom bracket of a vintage Schwinn, parts-swapping to get new builds started, and a lot of wheel truing and derailleur adjusting. With generous support from local shops Sic Transit Cycles and Two Wheel Tango, our parts bins are growing quickly. If you come early next week you’ll have your pick of wheels, pedals, water bottles, and of course the attention of our fantastic mechanics. We look forward to seeing you next Sunday, getting your feedback, and helping you out.